The external iliac vein is commonly used in renal transplantation for vascular anastomosis of the allograft renal vein. However, there are rare instances when the transplant surgeon may encounter thrombosis of the ilio-caval vein during surgery, making renal transplantation a challenge. Often, these patients are considered unsuitable for renal transplantation. 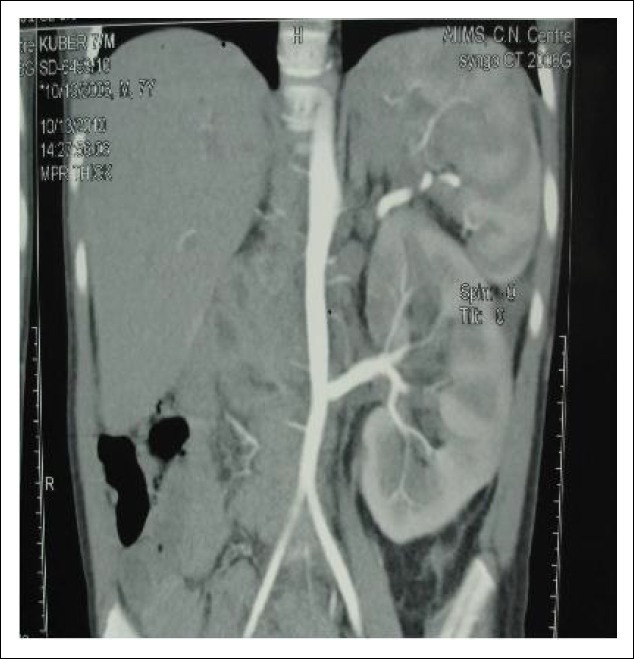 We report a case of thrombosis of the inferior vena cava in an asymptomatic pediatric patient in whom the splenic vein was used, at transplantation, for venous drainage. This case highlights that pre-operative Doppler screening should be performed in all potential renal transplant recipients. Thrombosis of the inferior vena cava (IVC) may be found in children with the Wilm's tumor as well as in those with indwelling femoral venous catheters, trauma and hypercoagulable states like the nephrotic syndrome (NS). The overall incidence of occurrence of thrombotic complications in patients with the NS is two percent; the incidence is lower (1.5%) in patients with steroid-sensitive NS, while in steroid-resistant NS it is 3.8%. Patients with IVC thrombosis classically present with bilateral limb edema and dilated superficial veins of the abdomen, although these may not be present in all patients. We report herein a 7-year-old child who was found, at transplantation, to have thrombosis of the IVC as well as both the iliac veins. A 7-year-old male child (weight 16 kg) suffering from end-stage renal disease (ESRD) due to steroid-resistant NS was referred for renal transplantation. The patient had a history of facial swelling, edema and recurrent upper respiratory tract infections since two years of age. Laboratory investigations revealed serum albumin of 1.1 g/dL, serum cholesterol of 414 mg/dL and urinary protein 4+. Ultrasound examination of the kidneys was normal. He was given steroids for six months with poor response. A renal biopsy showed features suggestive of mesangio-proliferative glomerulonephritis. The child eventually developed ESRD. Hemodialysis was initiated through a right internal jugular vein catheter. The femoral vein was never used in this patient for vascular access for dialysis. Later, due to access issues, the child was shifted to continuous ambulatory peritoneal dialysis. The patient also tested positive for hepatitis C virus infection, for which interferon therapy was initiated with good response. Because of poor oral intake, the child was on supplemental naso-gastric feeds for the preceding two years. At the time of transplantation, he had no edema, organomegaly or dilated veins on the abdomen. The only acceptable donor was his mother, aged 35 years. She had a one mismatch each on the A, B and DR loci. She had a single renal artery on the left side and the kidney was retrieved laparoscopically. Renal transplantation commenced with a standard oblique muscle cutting incision. However, both the iliac veins as well as the IVC were found to be thrombosed. The IVC was thrombosed up to the entry of the hepatic veins. A decision was then made to look at the portal system for a vein of suitable caliber. The superior mesenteric vein (SMV) was found to be of good caliber and anastomosis was attempted. However, this failed as the SMV was too thin and sutures started cutting through. 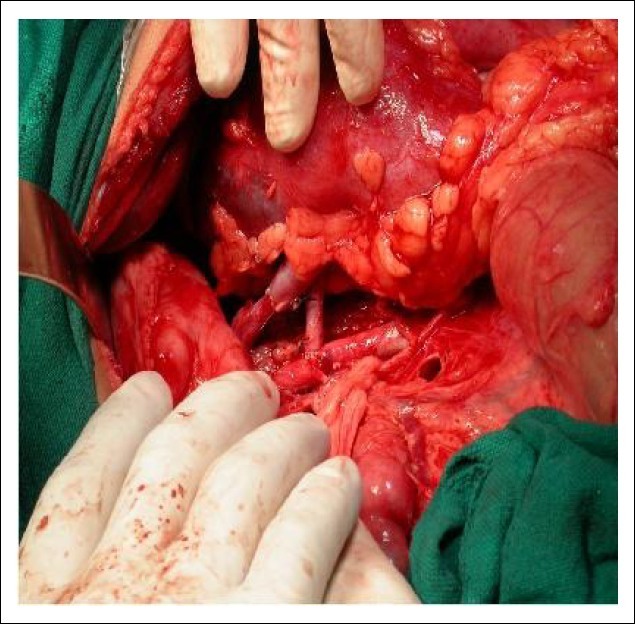 Finally, on extensive mobilization, the splenic vein was found to be of good caliber and an end-to-end anastomosis of the donor renal vein with the recipient splenic vein was performed [Figure 1]. The renal artery was anastomosed to the aorta (end-to-side) and uretero-neocystostomy was performed. Post-operatively, the patient was put on standard immunosuppression, i.e. tacrolimus, mycophenolate mofetil and steroids. He was discharged on Day 11 with a serum creatinine of 0.4 mg/dL. A post-operative isotope allograft scan showed normal functioning transplanted kidney while computerized tomographic angiography demonstrated a patent renal vein draining well into the splenic vein [Figure 2]. The child has now been on follow-up in our center for over two months and is doing well, with a serum creatinine of 0.5 mg/dL. Figure 1: Renal transplantation using the aorta and the splenic vein. Figure 2: Computerized tomographic angiogram showing drainage through the aorta and the splenic vein. Renal transplantation in the presence of IVC thrombosis is a challenge for transplant surgeons. The problem lies in finding a systemic or portal vein of adequate size to anastomose with the donor renal vein. Stevens et al reported a case of IVC thrombosis in a 5-year-old child in whom renal transplantation was performed using the sub-hepatic IVC after mobilization of the liver. Martinez-Urretia et al reported four cases of IVC thrombosis out of 238 pediatric transplantations, and in all four cases there were no signs or symptoms of IVC thrombosis. All these children were transplanted using native renal vein after performing native nephrectomy (orthotopic transplant). Patel et al reported transplantation using the inferior mesenteric vein in a patient with IVC thrombosis having IVC filter. Wong et al reported transplantation using a dilated left ovarian vein draining into the native left kidney in a patient with IVC thrombosis with good result. In our case, because both the iliac veins and the IVC, up to the hepatic region, were thrombosed, we performed the venous anastomosis using the splenic vein (portal system) with good result. Thrombosis of the IVC may be found in patients with the NS and other hyper-coagulable states. It may be asymptomatic and may be incidentally found during surgery if no screening was performed prior to surgery. In the presence of IVC thrombosis, renal transplantation becomes a challenge and lies in finding a systemic or portal vein of adequate caliber for anastomosis with the donor renal vein. Hence, we suggest screening of all patients who are at high risk for IVC thrombosis prior to transplantation. 1. Lilova MI, Velkovski IG, Topalov IV. Thromboembolic complications in children with nephrotic syndrome in Bulgaria (1974-1996). Pediatr Nephrol 2000;15:74-8. 2. Shefler A, Gillis J, Lam A, O'Connell AJ, Schell D, Lammi A. Inferior vena cava thrombosis as a complication of femoral vein catheterization. Arch Dis Child 1995;72:343-5. 3. Thomas SE, Hickman RO, Tapper D, Shaw DW, Fouser LS, McDonald RA. Asymptomatic inferior vena cava abnormalities in three children with end-stage renal disease: Risk factors and screening guidelines for pre transplant diagnosis. Paediatr Transplant 2000;4:28-34. 4. Yata N, Nakanishi K, Uemura S, et al. Evaluation of the inferior vena cava in potential pediatric renal transplant recipients. Pediatr Nephrol 2004;19:1062-4. 5. Stevens RB, Yannama GR, Hill BC, Rigley TH, Penn DM, Skorupaa JY. Successful Urgent Transplantation of an Adult Kidney into a Child with Inferior Vena Cava Thrombosis. Am J Transplant 2009;9:1953-6. 6. Martinez-Urrutia MJ, Periera PL, Ramirez LA, et al. Renal transplant in children with previous inferior vena cava thrombosis. Pediatr Transplant 2007;11:419-21. 7. Patel P, Krishnamurthi V. Successful use of the inferior mesenteric vein for renal transplantation. Am J Transplant 2003;3:1040-2. 8. Wong VK, Baker R, Patel J, Menon K, Ahmad N. Renal Transplantation to the Ovarian Vein: A Case Report. Am J Transplant 2008;8:1064-6.